User forums: You can find individual forums for all the key digital cameras from Canon, Nikon, Sony, Pentax, Kodak, Fuji, and Sigma, as well as forums for specific topics. Most of the forums have hundreds of fascinating posts a day. 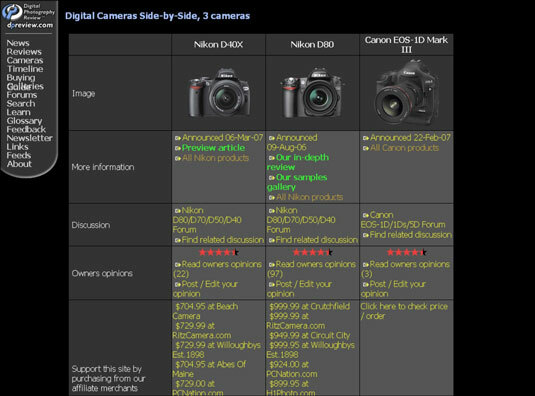 Camera comparisons: The site has separate pages for each digital camera vendor, listing all the most recent models, with complete specifications for every camera and links to reviews. You can compare the features of cameras from different vendors, too, as shown in this figure. Compare one camera’s features against another’s on DPReview’s Web site. Comprehensive reviews: The DPReview evaluations of cameras are among the most complete and thorough available on the Internet. You can even listen to the sound the shutter makes if that’s important to you. Daily news updates: The main page provides a listing of the main digital photography news stories of the day and more than a few rumors. An online glossary: Wonder what bokeh is? You can find a glossary on the DPReview site that explains this and just about any other term you care to look up.